The OT hangover sapped all the life from the Spurs in a blowout loss. 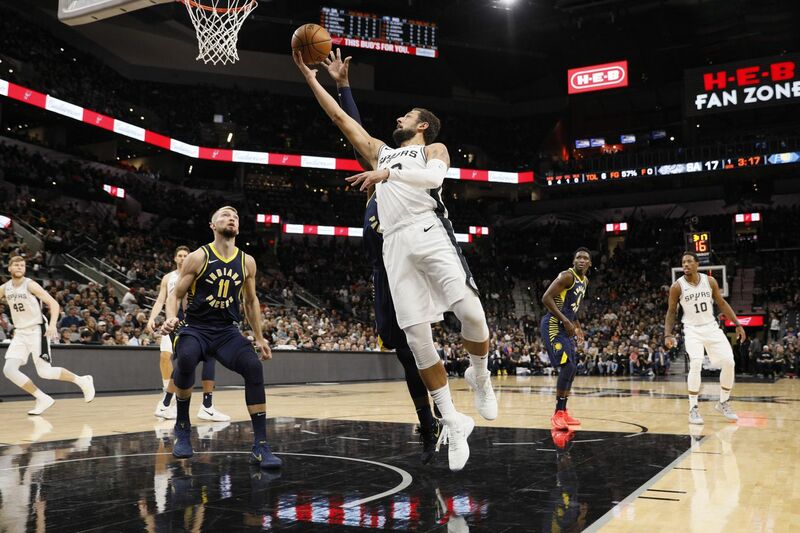 After Monday’s thrilling overtime victory on Monday in Los Angeles, the San Antonio Spurs returned home to take on an Indiana Pacers team that gave them fits last season but has been pedestrian on the road in their two losses. Unfortunately, the Spurs looked hungover, tired, and slow all game, while the Pacers were red-hot from the outset. This game felt more like we were watching last season’s Spurs (sans the good defense), and the Pacers ran away with a 116-96 win. DeMar DeRozan led the Spurs with 18 points and 4 assists, while LaMarcus Aldridge and Bryn Forbes scored 15 points apiece. For the Pacers, Victor Oladipo had 21 points, followed by 19 from Tyreke Evans and 16 for Domantas Sabonis. A slow start felt somewhat inevitable considering the late west-coast game on Monday and the fact that the Spurs skipped shoot-around this morning to rest. Sure enough, that was the case. They were a step slow on defense while the Pacers hit 8 of their first 10 threes and built a 42-26 lead by early in the second quarter. The Spurs never got closer than nine points after that. In all, Indiana hit 17-32 from beyond the arc on the night. All the minutes from the first three games may have finally caught up with DeMar DeRozan. He didn’t score until under five minutes were left in the second quarter, and it was on just his third shot. However, a late flurry of 8 points from him helped keep the game from getting away from the Spurs before halftime, as they were “only” down 62-50. Unfortunately DeRozan is going to keep getting high minutes until at least Derrick White returns. The good news is he and Lonnie Walker IV were behind the bench for this game, and Pop said there has been no setbacks on White’s heel. He did not offer a timeline for either of their returns. The Spurs didn’t start the second half much better on either end — which is to say they were meh-at-best on offense and lost on defense. At least for a little while, the Pacers cooled off after their torrid first half of shooting. The lead hovered between 9 and 13 for most of the quarter before a late 10-3 run by Indiana gave them an 88-71 lead heading into the fourth. By then, the Spurs were completely out of gas. The Spurs starting defense isn’t great, but the bench is just flat out bad in all kinds of ways. No one is a good one-on-one defender, one little fake and everyone is out of place, etc. When this group isn’t scoring, they’re a huge liability, and that much was clear as day in this game. Granted the Pacers were ridiculously hot tonight, but Gregg Popovich may need to start staggering his starters more, especially against teams with competent second units. Marco Belinelli got a technical early in the second quarter for arguing the refs. (Who’d have guessed he would be the first recipient of the season?) He could be heard saying “oh come on” over the TV mics without any exaggerated gesturing (other than demonstrating that he was pushed). Unless he said more that we couldn’t hear, it was one weak T.
Cory Joseph has a corn row/bun thing going now. We’ve seen Pop tease his former players about new hairdos before, so you have to wonder what he had to say to Cojo. Maybe something about if they suddenly made him a three-point shooter? He scored 12 points against his former team while shooting 4-6 from three. For the Pacers fans’ perspective, visit Indy Corn Rows. The Spurs return to the AT&T on Saturday to take on the Lakers (again). Tip-off will be at 7:30 PM CT.